Goa: The 2nd PAN IIT Biotech Meet was organized between 5th and 7th October 2017 at Goa by Indian Institute of Technology Madras, Bhupat and Jyoti Mehta School of Biosciences, in association with Mehta Family Foundation, Houston, U.S. and IIT Madras Office of International and Alumni Relations. The objective is to bring researchers, faculties, expertise from different IITs, Indian Institute of Science (IISc), Bengaluru, inStem and Biotechnology as well as Biopharmaceutical industries on to a single platform to discuss recent advances and challenging problems in Synthetic Biology and Cardiovascular Diseases. 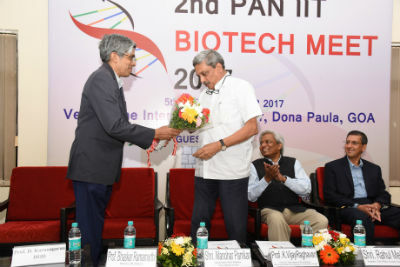 The conference was inaugurated by the Chief Guest Mr. Manohar Parrikar, Chief Minister of Goa, in the presence of Prof. Bhaskar Ramamurthi, Director, IIT Madras, Prof. D. Karunagaran, Head, Department of Biotechnology, IIT Madras, Prof. Rama Shanker Verma, Organizing Secretary, PAN IIT Biotech Meet, IIT Madras and other dignitaries. The Government of Goa will extend support and will definitely consider providing assistance to research in Biotechnology. “The Education I got in Engineering helped me in politics as I’m able to analyze a problem and arrive at solutions in a logical process,” added Mr. Manohar Parrikar. He is first IIT graduate (Metallurgical Engineering, IIT Bombay) to become a Chief Minister. These meetings have the potential to have a major impact. The DBT was willing to fund major projects and invited proposals from faculty teams across institutions. Such Workshops facilitate the formulation of proposals, he added. Speaking during inaugural session, Prof. R. Nagarajan, Dean, International and Alumni Relations, IIT Madras, thanked the Mehta Family Foundation, the DBT and the Government of Goa for their support. “Thanks to all the support, only sky’s the limit for bioscience & engineering research in India,” added Prof. Nagarajan. Mr. Rahul Mehta of the Mehta Research Foundation said that multi-institutional faculty teams should take up grand challenges of relevance to India and achieve quick impact. Various sessions were held during meet on topics such as ‘Control of metabolic pathway fluxes by Synthetic Biology approaches,’ and ‘Cardio vascular diseases.’ Experts and faculty from across the country participated in the Meet.